LexisNexis Group provides computer-assisted legal research for its clients, as well as business research and risk management services. 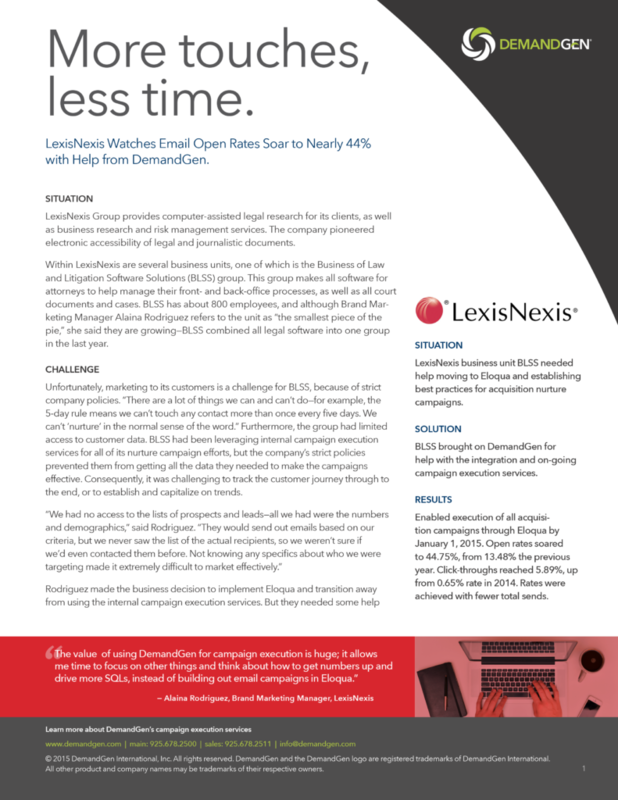 The company pioneered electronic accessibility of legal and journalistic documents.LexisNexis business unit BLSS needed help moving to Eloqua and establishing best practices for acquisition nurture campaigns. BLSS brought on DemandGen for help with the integration and on-going campaign execution services. By January 1, all acquisition nurtures were being handled in Eloqua. DemandGen now executes all the company’s acquisition campaigns. Enabled execution of all acquisition campaigns through Eloqua by January 1, 2015. Email open rates soared to 44.75%, from 13.48% the previous year. Click-throughs reached 5.89%, up from 0.65% rate in 2014. Rates were achieved with fewer total sends.